A friend of mine recently had a long discussion with Mr. Kurt Adolff, the German race driver from the early 50s, who last Monday celebrated his 80th birthday, and is still doing well (e.g. travelling long distances by car across Europe ...). Adolff in 1953 had some drives for the Scuderia Espadon, and this causes me to dive in the history and the background of this private racing team. The result was more or less disappointing, not much could be found, and countless questions remain open. To most of us the Scuderia (or in French Ecurie) Espadon and Rudi Fischer are familiar through numerous listings in the 1951 and 1952 statistics, there was also some information in the June edition of 8W, including a fine article from our friend Alessandro Silva (http://8w.forix.com/8w-601.html), but also here not much background information is available. I made a list of all race entries I could find for the Scuderia Espadon and other possibly related Swiss drivers, which can be downloaded at http://www.axos.nl/r...ria-Espadon.doc (WORD file). Rudolf (Rudi) Fischer is described as bespectacled wealthy Swiss restaurant owner and amateur driver, born 1912 in Stuttgart, and died 1976 in Luzern (Lucerne). That’s it, nothing more I can find. Additionally, strange enough Kurt Adolff says Fischer was owner of an electro wholesale business. So what is true? May be both “Espadon” is the French word for sword fish, very often used for restaurants specialized in fish dishes, so possibly this was the name of his establishment. But where was it located, and how was it possible to finance a private - but professionally operating - racing team, especially if Le Patron was on road most of the year? What led him to racing at the age of 36, and had there been earlier activities before the war? Did he ever get an offer as professional works driver, and if yes, why did he refuse? And why did he stop at the top of his career, after winning the 1952 AVUS-Rennen? Even less is known about the secondary team members, Peter Hirt (1910-1992) is described as wealthy businessman from Küssnacht, near Zürich, who had a successful precision tool manufacturing business. Rudolf Schoeller was also Swiss, although born in Germany in 1902, nothing more known. Peter (or Pierre in French) Staechelin was from Basle, and from Max de Terra only dates of birth (1918) and death (1982) are known. What was the relation between Fischer and these guys? In 1948 and 1949 Fischer drove Gordinis, details as per Alessandro’s 8W article, and as per a.m. WORD list. Besides sporadic works entries, he used already the term “Ecurie Espadon”, but other races he entered simply under “Rudolf Fischer”. Any explanation for this? The first appearance of Peter Hirt I have for the 1948 Prix de Berne, the supporting voiturette race for the Swiss Grand Prix. He entered a FIAT, but DNA or DNS. As Alessandro writes, Fischer returned the Gordini end of 1949 to the factory, anybody knowing the reasons? Seeing the alternatives for 1950, such decision looks unwise. In April at San Remo he entered a “SVA-FIAT”, but I was unable to find out whether he really showed up with this car. The same obscure car he entered again for the Swiss GP in June, and for the F2 race at Aix-les-Bains in May. At all 3 events the car obviously was a “no show”, so I am highly interested to learn more about this car. As sometimes it is named also “Fischer-SVA”, it may be possible that this was a personal project from Fischer himself, and returning the Gordini would mean that such project must have been more than only an idea in his mind. Alessandro states that the car was supercharged, but the F2 entry for Aix-les-Bains would exclude this. So, anybody out there having any idea what the “Fischer-SVA-FIAT” was?? Obviously the SVA project failed, as the rest of the year he first drove an OSCA MT4 for the Ecurie Helvetia Corse, and later a factory HWM-Alta with limited success. Any information about the “Ecurie Helvetia Corse” known? 1950 was the year of the “Ecurie Suisse”, some drivers we have seen already earlier joined together and bought a bunch of Veritas Meteor F2 cars from Ernst Loof. There is no relation between “Ecurie Swiss” and “Ecurie Espadon” at this stage, however I believe it may belong into the overall picture. Ecurie Suisse was Peter Hirt, Paul Glauser, and Kaspar Aebli, plus the pseudo “J.M. Marcy” from Belgium. They entered their Meteors at Erlen, Bern, Geneva, and the German GP. It is not clear how much cars they really owned, 3 or 4. Anybody with more details about the “Ecurie Suisse” and their members? And who was “J.M. Marcy”? 1951 was a very busy year for Rudi Fischer, as he entered his newly acquired Ferrari 212 in a total of 15 races. All sources report that this was a new car, and specially built for Fischer, but I have good reasons to doubt this. First of all, the engine. It was a tipo 212, meaning 2540 cc and approx. 200 HP. With the Alfas having double power, and the works Ferrari 375 nearly to that, the 212 was totally uncompetitive. Also against the older Maseratis 4CLT and Talbot-Lagos the 212 was underpowered, and the projected 500 HP of the new BRM showed the things to come. Buying a new monoposto Ferrari was not cheap, for sure, so why spending a horrendous amount of money to buy an uncompetitive car? The possibility to swap engine against a 166 F2 one to participate in both classes is no argument, as this could be done also with the 125 supercharged F1 engine, see Peter Whitehead. Was it a second hand car? Probably yes. But over the winter 1950/51 Ferrari renumbered all monoposti to 4-digit numbers, excluding the tipo 375 works cars, but including all customer cars who entered the factory for service. In the same period nearly all 1949 and 1950 cars had been rebodied, so it is nearly impossible to define single histories. We know that Ferrari in early 1951 tested another 212 race car, # 102, which was entered for some early races that year before it disappeared in the grey mist of history. May it be that they built 2 prototypes, and sold one to Fischer because they had no real need for it? In other words, was Fischer’s 212 a bargain? But even so, why not fitting it with a 125 s/c engine which had the same exterior measurements? Would like to hear reasonable ideas, why Fischer opted for a 2.5 liter engine, with the new formula for 1954 not yet announced. After Fischer bought the Ferrari, the name of the “Ecurie Espadon” obviously had been changed to the more Italian minded “Scuderia Espadon”, which simply means the same. Between March and May 1951 a second Ferrari was entered for Max de Terra (Siracusa F1, Bordeaux F1, Autodromo F2, Genova F2). De Terra the year before had acquired the ex-Chinetti 166 MM Le Mans winning car, which he entered in some national sports car races (Erlen, Bern, Geneve). De Terra’s Ferrari in most statistics remains a miracle, in others it is described as # 06C, which clearly is wrong, as this was Franco Cortese’s car which appeared simultaneously with de Terra’s Ferrari. The solution can be found at the Schlumpf Collection, they have a Ferrari V12 1.5 liter SOHC supercharged engine, marked “12C” and “STAECHELIN”, and which is reported to have been acquired from Switzerland together with the 212 and the 500 Espadon Ferraris as package deal. So Staechelin’s car obviously was “multi-engined”, 125 s/c for F1, and 166 for F2, similar to Whitehead’s # 0114, and similar to Raymond Sommer’s 1950 works car. But which car was it? Possibly the 1949 GP machine # 12C, which in 1950 was the SF’s reserve car (Chinetti at Penya Rhin? ), but possibly also one of the 1949 F-series F2 cars, which had been nearly identical to the GP cars, and which easily could be converted to F1. The next question which arises is the ownership, was it owned by Espadon resp. Fischer, or was it de Terra’s property, which he entered only under the Espadon banner for organisational reasons? Max de Terra’s show up on the Grand Prix scene was not very successful, he finished all 4 races, but mostly in last position with 6, 7, or 8 laps behind. After Genova in May 1951 de Terra disappeared from the actual racing scene, and with him the car. Next year we find him in an Alfred Dattner (?) entered Simca-Gordini T11 at the Swiss GP, and in 1953 he entered his home Grand Prix at Bremgarten in the “Espadon Rent-a-Car” tipo 212, but then his story seems to end. Who was Max de Terra? Another “wealthy business man” trying to have some fun in racing? Any detail concerning de Terra, his relation to Rudi Fischer and Espadon, and the history of his car before and after he drove it is highly welcome, and a photo would be an unexpected highlight. For the Suisse GP at Bremgarten Peter Hirt entered his Verias Meteor under the Espadon banner. This most probably only happened for organisational reasons, but could have been the start for a more closer cooperation in 1952. At Erlen in August he entered as private person again, the same did Kaspar Aebli with one of the other Meteors. So it seems that the “Ecurie Suisse” partnership had broken. In April 1952 at the Torino GP Rudi had the possibility for a works drive in the new factory tipo 500, resulting in a fine 3rd place behind the much stronger 375’s of Villoresi and Taruffi. It is reported that Enzo was so impressed that he agreed to sell him one of the new 500. But what did Fischer drive 3 weeks earlier at Siracusa? His own 500 # 0184? Or also a works car? Stats show # 0184, but it seems he got this car only later, and the works cars for Siracusa had been # 001 (Taruffi), # 003 (Ascari), and # 004 (Farina). So the possibility is there that Fischer drove the SF # 002 already at Syracuse. If so, it would be an interesting fact, 2 works drives for Ferrari, but finally remaining privateer. Did Ferrari refuse him? Or was it Rudi who wanted to remain independant? Also the year 1952 was very busy for Fischer with a total of 15 races. At Torino we see Peter Hirt the first time at the wheel of Fischers old tipo 212. From now on the tipo 212 was entered only in F2 events, meaning that the 166 engine was finally fitted. This is mixed up in some statistics, as sometimes # 0110 is shown as “212”, and sometimes as “166”. Peter Hirt now for the first half of the year was accompanying Fischer on his “European Tour”, driving # 0110 with very limited success. At the Eifelrennen in May 1952 we see the German Fritz Riess at the wheel of # 0110, and at the German GP in August the Swiss Rudolf Schoeller got his one and only chance (he had been entered already for the French GP at Rouen as alternative for Hirt). And for the last 3 races of the season in September (Monza, Modena, AVUS) the German pre-war racing ace Hans Stuck took over the wheel instead using his own AFM. It would be logical that Fischer rented # 0110 to others in order to cover his overall expenses at least partly, but details are not known. What kind of contract had Fischer with Hirt, and why did he stop after Silverstone in July? Missing sucess? Too expensive? No time? Any details are welcome. And what about Riess and Stuck, how did they enter the “Swiss Connection”? After winning the last race of the 1952 season, the AVUS-Rennen at Berlin, Rudi Fischer unexpectedly stopped international racing without any reported reason. Okay, he was 40 already, but that was no age for a race driver of that period. The car was competitive and eligible also for the 1953 season, and after years of representing the “olympic idea” Rudi was able to win 2 major races that year. So what caused Fischer to stop? Personal reasons? Money? Very important question, which obviously nobody answered up to now. Although Fischer retired, the Scuderia Espadon sporadically showed up also in 1953. But here the new information received from Kurt Adolff is very interesting. He says that he didn’t know the name “Espadon”, the name of the team for sure was “Ecurie Suisse”. He also said that owner of both cars now had been Rudolf Schoeller, who bought them from Fischer. Schoeller was already 50 then, and after the 1952 German GP he clearly decided for himself that he’s too old for active racing. But be loved the atmosphere, and saw his own capabilities more in a team owner function. Acc. to Adolff, Schoeller bought both cars, but the deal was that the old work horse, the 212/166 # 0110, was still at the disposal of Rudi Fischer for some Swiss hill-climb events. This would make sense, as # 0110 appeared only twice in 1953, at the German and the Swiss GP. Although there is some info that Rudi Fischer sporadically entered some national hill climbs, it is totally new for me that he used # 0110. Would like to have more information about Fischer’s hill climb period, what about Hans, he’s the specialist for this? Unfortunately I do not know more about the details of the 1953 season of “Ecurie Suisse” (or “Ecurie Espadon”?). Only 3 races in Germany, the Swiss GP, and the showdown at Monza where both cars had been nominated but never showed up. Also details about Rudolf Schoeller are missing, and what caused him finally to give up the team. There are some rumours that the tipo 500 had been upgraded to 625 in 1954, and also some possible appearances as late as 1955, but no details known to me. What happened to the cars after 1953, and how and when did they find their way to their restplace at the Schlumpf Collection? A lot of open questions as one can see, and everybody who is able to fill in some of the gaps is invited to do so. I am having the same trouble as Michael when I am presently wanting to go beyond the sentence "...was a wealthy amateur..." in my work for 1946. As for Fischer. I think I can say more on why he returned the Gordini to the factory. I'll look into Huet's book tonight. If my memory does not fail me the "Swiss" OSCA was one of the first two made and Ecurie Helvetia Course was one of the many Geneva-based racing outfits controlled by Ciro Basadonna whose main activity was the one of a middleman between teams/drivers and organizers. What is puzzling is that in reading accounts of Swiss things of the period, a deep distinction between Geneva/Lausanne and Zurich based drivers could be detected while this one should not be the case, but I am maybe wrong in that impression. Cimarosti's Grand Prix Suisse gives the town of origin of each Swiss driver. The SVA. I also would love to know something about. You will not believe it but around 1951 I had a dinky of a little green car listed as SVA-Midget. It was made by Mercury, an Italian toy-maker. Since then I am curious. If it was the same car, where Midget races were held in Europe at the time? I recently discovered that there was at the time a short oval in Vallelunga; maybe the answer is very close to home with a Fiat engine and an Italian dinky. My recent experience about wanting to know more about drivers has shown me that the best bet are obituaries. The Swiss AUTOMOBIL REVUE will certainly have what you want. But do not forget to let me know, once you you have found them! Astonishing that besides Alessandro - which I expected! - nobody else can contribute any answer to the numerous questions thrown up here. The distinction between people - not only drivers - from the German- and the French-speaking part of Switzerland I believe is normal. Although this borderline was and is not as obvious as in Belgium, it is there, and if it is not mentality, it is the language. All Swiss are educated multi-lingual, but mother tongue always will be preferable language for communication. The mentioning of Basadonna’s agency business is interesting. Since years I’m thinking about the communication channels in those days, very slow surface mail was the standard, telegrams had been expensive and very often garbled, and border-crossing telephone calls difficult. How did drivers know about date and regulations of the events, and how are e.g. starting moneys negotiated? Chico Landi in 1948 arrived at Bari with a supercharged car (was it a Maserati? Don’t remember), only to find out that the race was for F2 only, so Besana lent him his Spyder Corsa. Considering this, the business of Basadonna really makes sense, and I really wonder whether there had been more agents like him. Would be worth a separate thread. Peter Glauser was the founder of Ecurie Suisse , this man owned a garage in Switzerland. Peter Hirt was driver for him with a batch of Veritas . Now JM marcy I have absolute no idea about him, but may be it could have a connection the belgian Veritas ? and Savonuzzi, this is pure speculation. cisitalia . In 1949 Savonuzzi decided to build a SVA. Oups I did it again, Peter Glauser is Paul Glauser. the name. You know memory !! C Basadonna . I ve got it but where . After 50 years I'll be able to find out how the real SVA looked like. Right after Savonuzzi left Cisitalia in 1949, he "..started working on a 1L 4cyl supercharged engine.." (Taruffi), but he left for the US soon afterwards. It was Ecurie Auto-Sport, but Basadonna was behind many other Geneva-based outfits. Can you find out where the article on him was published? This is for Michael. I have the impression that having or being a "manager" was not considered in good taste at that time and that, for instance, Basadonna had to cover his activities by posing as a driver. Also, Nuvolari and Varzi both had "secretaries" in the 30s. Their job though would be called the one of a manager today. He then left for Carrosseria GHIA AND after Chrysler . Ciro Basadonna started competition in 1928 with a Fiat. L Quadri and A Hug to create Ecrie Helvetia. Zwitserland and works as director for P Dusio . P Dusio an in the deal he received also 2 Maserati 4 CL ? M Balsa builder of Balsa speciale wrecked one. The budget was very tight. T Nuvolari was there, it's the only exception. C Basadonna despite his italian nationality had a swiss driver license. because the starting money was better . I had now a child". Alta, Maserati, Cisitalia and lancia. He appears only a few times at the wheel of a Cisitalia D 46.
good sum-up (translation) of the article in RETROVISEUR !! Thank you very much VDP. Will you please send me at silva@mat.uniroma1.it your full name so that I can acknowledge your help in my work? I am sure that the 2 Maseratis that Basadonna got after the war were two 6CMs. One was destroyed by Balsa at Forez. I did not know that their origin was from Dusio. Was very busy, therefore some delayed reactions. There is no obvious direct connection between Ecurie / Scuderia Espadon and Ecurie Suisse, except that Peter Hirt drove for both, and the statement of Kurt Adolff that the Scuderia Espadon was renamed Ecurie Suisse in 1953 after Rudolf Schoeller took it over. a Cisitalia Spyder” - to whom is this sentence related, to Fischer, or to Staechelin? However, would like to have more details about place and time. Don’t believe that Staechelin was Fischer’s financier, their only mutual appearances had been in 1951, where Staechelin entered his (?) Ferrari 125/166 under the Espadon banner. Interesting details about the SVA, however, I consider the engine configuration somewhat strange. Formula 2 was 2 litre u/c and 500 cc s/c, and F1 1.5 liter s/c, so what was the background of 820 cc s/c? Very strange! The quoted Tragatsch book, which one do you mean? Quote: “One of the founder was Ciro Basadonna”. Of what? Strange that agents resp. managers had been considered as “unwanted persons”, however, it was a different time then. But secretaries or “managers” for very busy drivers like Nuvolari I believe really made sense. Don’t forget, all the things which today can be arranged by a simple mobile phone call in this era needed letters or telegrams. Could you imagine Tazio sitting behind an outdated black typewriter, and filling in entry forms, or hotel reservation requests?? Don’t have the photo from Torino 1952, but me files say Fischer drove his Tipo 500 there, whereas the Tipo 212 was in the hands of Peter Hirt. The Tipo 625 only came in 1954, Taruffi drove a Tipo 375 in which he finished second. And Fischer’s HWM period in 1950 seems to be solved now also, he was no official works driver, but obviously only rented a car from them, which was entered under HW Motors. If you can dig out more about the SVA project, a lot of TNF members - including myself - would be pleased. I have found two pictures of Espadon Ferrari at Pau 1951. Let me know if you want them. I have found two picures of (allegedly) Serafini 212 for Siracusa 1951. Let me know if you want them also. Hans has sent me the scan of the pages in a book by Tragatsch concerning the SVA. There is plenty with a picture also (of course it is my dinky finally!) I'll try to re-scan them and post but somebody else has to do the translation. My (very ancient) memory is that the SVA was intended for some stillborn oval racing in Italy, but I could be wrong. (2) I want to compare with the "survivor" car which is claimed to be # 0102, and which I doubt. Concerning the Tragatsch scan, what do you mean with "rescan"? Is it a print only? If so, it may be better to have the original scan from Hans because of quality. If the text is not that long, I can translate it into English, and post it here. and the rebodied prototype 625 for P Taruffi. Moss book My cars, My career. N Farina and M Hawthorn. Robert, you mean that 625, okay, sorry, details of Bari (Taruffi) and Monza (Landi) of course are known. What is not commonly known is that Taruffi drove that car at Torino 1952, because at that time it should have been a tipo 500, either # 001 or # 002. All statistics I know show for Taruffi a 375. And Rudi Fischer is reported to have driven the works 500 # 002 at Torino, race # 22, the Espadon 212 # 0110 had race # 30 and was reportedly driven by Peter Hirt. Would like to have a scan of this photo if possible, could be interesting. For Fischer in 1948 I have only the 2 Gordinis, # 02GC and # 05GC, but that does of course not exclude the Cisitalia 202 Spyder for sports cars races. Interested in more details. Alessandro mailed me the Tragatsch article, which hereafter I tried to translate into English. "After the WWII Eng. Giovanni Savonuzzi was concerned together with Eng. 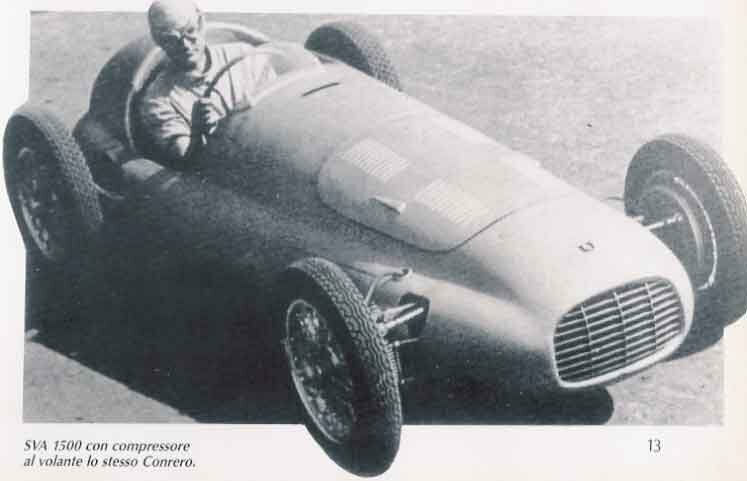 Giacosa at development and construction of the 1100 cc Cisitalia racing cars with FIAT engine, but already in 1949 the man from Torino created an own construction, the SVA. It should be said that Savonuzzi was also responsible for the open 2-seater “Mille Miglia” Cisitalia, in which the unforgettable Tazio Nuvolari reached second place overall at the 1947 edition of this event. Also this type was equipped with an 1100 cc improved FIAT engine. Savonuzzi’s new racing car was unconventional in every respect. It had a straight 4-cylinder engine with 68 mm bore and 56 mm stroke, resulting in a total displacement of 820 cc, 2 overhead camshafts running in roller bearings, a Centric supercharger, independant suspension, front torsion bars with parallelogram links, rear DeDion axle with coil springs, hydraulic 4-shoe brakes, etc. The whole Savonuzzi engine - destined originally for American Midget race cars - weighted only 92 kgs, the complete racing car 351 kgs without fuel. The constructor stated a power output of 140 HP at 8200 rpm, but on the testing bed 160 HP are reported. Savonuzzi intended also to build a similar 1100 cc sports racing car, but for unknown reasons a serious production was never realized. As far as known to the author, this able constructor later emigrated to North America. But before he constructed a Formula 3 racing car named “Falcone”, which was equipped with the very successful 500 cc V2-cylinder OHC Moto Guzzi racing engine. This engine had 68 mm bore, 68 mm stroke, with a power output of 48 HP at 8000 rpm, and drove the highly modern constructed “Falcone” to a top speed of 170 kph." My first impression is that this car looks rather modern compared with the Cisitalia D46, and also the technical details look impressive. Calculating the power output of 140/160 hp to 1.5 liters would result in 256/293 hp, not bad comparing it with Ferrari and Maserati. For me that SVA didn’t look like a Midget racer, more like the Mercedes W165, although slightly offset (drive shaft?). However, Midget racing would make sense with regards to engine dimensions, 820 cc = 50 cubic inch, anybody knowing the comtemporary specs of Midgets? Tragatsch says that the engine has been developed for Midget racing, he’s not talking about the whole car. As said already, the SVA engine for Fischer was no workable option, not eligible for F2, and not competitive for F1. So here the “SVA-FIAT” or “Fischer-SVA” as mentioned in the statistics (DNA/DNS) could make sense. The SVA itself represented a very fine car based on chassis and low weight, and it may well be that Fischer intended to equip it with an eligible engine. Remarkingly are the (DNA) entries for F1 and F2 events, which could mean 2 different engines, obviously of FIAT origin. I have to admit that I’m no specialist on Gordini, but as far I know the early Gordini engines had been FIAT engines, as Simca built FIATs in licence, and Fischer had just made some rather good experiences with Gordini. Possible is also a Cisitalia engine, but 1100 cc u/c does not look competitive for F2, and surely not for F1. So which engine configuration Fischer could have had in his mind? Any proposals? I will check the Gordini book . was this engine swap done at the factory ? I'm following all of this with great interest, but one point remains unanswered - did the SVA actually appear at San Remo in 1950? Michael, your third sentence (of this quote) contradicts your first. Have you concluded that the SVA was obviously a no show at San Remo, or are you still unable to find out? "Fischer was allowed to start at the back of the grid without managing to set a practice time, but retired on the first lap with a broken oil pipe". It is easy to see how a dna can become confused with a dns, but Hodges is pretty unequivocal that the car actually took the start, even to the extent of giving a reason for retirement. So, did it or didn't it? If I would know, I would have written it. Using the term "enter" means that the entry form obviously has been submitted to the organizers, as a car and/or a driver shows up in the statistics. For San Remo 1950 Fischer and/or the SVA is not mentioned in the statistics available to me, I only have the information written by Alessandro in his 8W article. Why are you sure that we all are aware of what Hodges has to say on the SVA at San Remo? If so, I would have mentioned it. Therefore thanks for this info, which is very valuable. At the F2 race at Aix-les-Bains my stats show a DNS for the SVA, whether it was even a DNA I cannot say, but Fischer himself did appear and raced the OSCA. For the Swiss GP 1950 most stats do not mention Fischer and the SVA, but on his French website Pierre Tritten says "Rodolphe Fischer sur SVA Fiat de l'écurie Espadon forfait". So if the car obviously was existant at San Remo and even turned a wheel, a really wonder why it did not appear (or start) at later events. Information on this obscure one-off is elusive, but at least Mike Lawrence has established that it had a supercharged Fiat engine. It started in one Formula 1 race, the 1950 San Remo GP, when Rudolf Fischer retired it on the first lap. That implies that it is from a published source by Lawrence, but Grand Prix Cars 1945-65 ignores the SVA completely. I don't have copies myself, but Lawrence produced a series of paperback reference works published by Aston in the early 80s. Perhaps there's something in there? Anyone got copies of those? The Aston book by Mike Lawrence is the Directory of Classic Sports-Racing Cars. Nothing in that about the SVA. The SVA entry in Hodges' A-Z is written by Mike Lawrence. He is listed as the editor and a contributor. Any story about this car ? or derivated ? Swiss racing is very special ike Maserati Suiza ? before the swiss GP as 0208 the francorchamps car was just delivered the day before GP des Frontières . This would make sense, because some sources say Ferrari agreed to sell him a private tipo 500 after his excellent drive in the works 500 at Torino. This was April 6, and Siracusa earlier on March 16. Siracusa was Formula 2, so most probably Fischer drove his tipo 212 with a 2 litre engine making it a tipo 166. However, the 500 # 0184 was delivered earlier than Bremgarten on May 18, as he entered it for Pau already on April 14. Here is an other interesting picture, that would raise another question: has the name ESPADON something to do with fishing????? Look at the logo on the side of the car. And the other question would be: why did they call their Scuderia ESPADON? Where was this fine picture taken? Behind Rudi Fischer stands a SIMCA(!) Gordini carrying #12. Any Idea anybody? has the name ESPADON something to do with fishing? Obviously the photo shows Fischer in a Gordini T11 during 1948 or 1949. Checked all races in question, the only one where a Gordini (except that of Fischer) carried # 12 was at the Prix de Genève on 2 May 1948, the voiturette support race to the Prix des Nations. # 12 was Robert Manzon's car, whereas Fischer - under Ecurie Espadon banner - had # 4. The "Espadon" in fact is a sword fish, a name very often used for French restaurants ("L'Espadon"). Fischer had a restaurant at Zürich, so it was possibly the name of that place. After switching to Ferraris, "Ecurie Espadon" became "Scuderia Espadon", meaning the same, but in Italian. Has to be 1951 then, anyone with the appropriate Black Book at hand (I'm too lazy... ) should be able to find out (or at least narrow down). According Christian Huet's book (Gordini,...), and I'm inclined to believe him, Rudi Fischer had #12 at Angoulême (Circuit des Remparts, 12 June 1949). He finished 6th in qualifying heat 1 and no-starter in final. So it was not there !!! Robert Manzon (Simca Gordini T11 4GC), GP de Genève, 2 May 1948. Jean-Pierre Wimille (same car), GP de Monaco, 16 May 1948 (Fischer was not driving a Gordini). Olaf Landbru (? ), Swedish GP at Stockholm, Fischer not present. The fuel filler and the racing screen clearly shows a Gordini, and not a Ferrari. Furthermore the tipo 212 and the 500 had been painted red with a white triangle on the bonnet, whereas the car here obviously has a dark (red) back, and a light (white) body. The "Espadon" fish logo as far I know was also not present on Fischer's Ferraris. So only possibility is Prix (not Grand Prix) de Genève 1948, Fischer's first race (except possibly the Cisitalia sports car mentioned by Robert, but which is not confirmed yet). Checking once again in "Les Grand Prix de Provence et de Marseille" (Maurice Louche), it was not at Marseille. The pits was rudimentary (open-air) and Fischer (#26)'s pit's place was not next to the Gordinis. So we have a picture of Rudi Fischers first race, here is one of his last (or should I say his last GP?!). Anybody an idea who is the guy on the left? Isn't it strange, Fischer quit motor racing after he had such a fine '52 season? The 1935 Preis von Bremgarten? Fischer’s last (circuit) race was the AVUS race on 28 Sep 1952, which he won. Does that mean that the photo was taken there? No idea who that other guy is, will try to find out. 1935 Preis von Bremgarten?? The „Prix de Bremgarten“ oder „Preis von Bremgarten“ was always sports car supporting race for the Swiss Grand Prix, do you mean that Fischer participated there as early as 1935? I think that was very much a one-off. He no doubt concentrated on his studies after that, then hit the war years, and was presumably building up his business before he got back behind the wheel again. Interesting, didn't know that. Any more info available? Car? Placing? The Preis von Bremgarten was a supporting event for the Swiss GP, giving Swiss drivers what was for most of them their only opportunity of circuit racing each year. The 1935 race was the first. Future Mercedes and Auto Union GP driver Christian Kautz, driving his first circuit race, qualified fastest in a voiturette Maserati ahead of Hans Rüesch (Alfa Romeo P3) but neither finished the race, and winner was Max Christen in his old 3-litre Maserati two-seater. There were separate classes for voiturettes and sportscars under and over 1500cc. Rudi Fischer won the big sportscar class in an “Alfa Kompressor”. In an 1950 edition of "Das Auto" I found an interesting article about Rudolf Fischer and the Mercedes-Benz W165. As commonly known this was the Tripoli 1939 1.5 liter voiturette, and both cars during the war had been transferred to Rudi Caracciola in Switzerland. Although Rudi claimed right of property on the cars, the Swiss authorities evaluated them as German industrial property, and confiscated them. The juridical fights lasted several years, but in 1950 finally the cars had been put on offer by the "Verrechnungsstelle". The price asked was SFR 100.000, but nevertheless several parties showed interest, one of them was Rudolf Fischer. He contacted Mercedes-Benz and asked for potential technical assistance, under the condition that one car they will prepare for himself, and the second car they will receive as payment for such work. Daimler-Benz refused, by claiming the potential expenses for making the cars race-ready to be as high as DM 1 million. Later that year Fischer had a long personal discussion with Neubauer during a dinner of the ACS, where Neubauer explained him that it would make no sense to reactivate these cars. When leaving for Tripoli in 1939 they had been in are more or less unfinished and untested state, and also after the race there was never a possibility to check the cars on hidden damages. They had been prototypes, and making them race-ready would mean much more than simply changing oil and tires. Neubauer also was convinced that the cars with their 245 HP would be absolutely outdated and uncompetitive nowadays. After this discussion Fischer finally dropped the idea of acquiring the cars, which finally were sold to Mercedes-Benz Schweiz at the required SFR 100.000 exclusively for museum purpose. This story is interesting in some points. First of all, it throws some light on Fischer's irresolution during 1950. He returned the Gordini, played around with the mysterious SVA, rented temporarely a HWM, and withdrew from racing for the second half of the year. Interesting is also that obviously he saw a chance to raise the required sum of SFR 100.000 for the 2 W165, which in those days was a horrendous lot of money for 2 non-operational racing cars. Was the glory of the Tripoli victory shining so strong that Fischer - and some others - were convinced that these cars could beat the actual Alfas and Ferraris? Only after the chat with Don Alfredo in November 1950 it seems that Fischer looked for potential alternatives, which resulted in the purchase of the Ferrari 212. I don't know if this is of any use. Is it the car that raced in 1950. If yes where? I am looking for info about this car for long, because I would like to create a model of it. Strange is, that wikipedia site (http://en.wikipedia....mula_One_season) lists the SVA in the 1950, while at f1.facts it isn´t mentioned (http://f1-facts.com/). It´s always a problem with these internet sources. First, IMO Wikipedia is wrong with listing Fischer´s entry under the Ecurie Espadon banner, as like we have worked out in this thread, the team was formed and founded only in 1951. Beside this if you look at the race report http://en.wikipedia....wiss_Grand_Prix you see, that Fischer was a non-starter. That is probably the reason, why it is not included in the stats on http://f1-facts.com/.